This is the eighth and final post in a series of blog posts exploring some of the security features of Apache Knox. The previous post looked at how to authorize access to Apache Knox using Apache Ranger. We have also previously looked at how to achieve single sign-on using the Knox SSO service. In this post we will combine aspects of both, to show how we can use Knox SSO to achieve single sign-on for the Apache Ranger admin service UI. 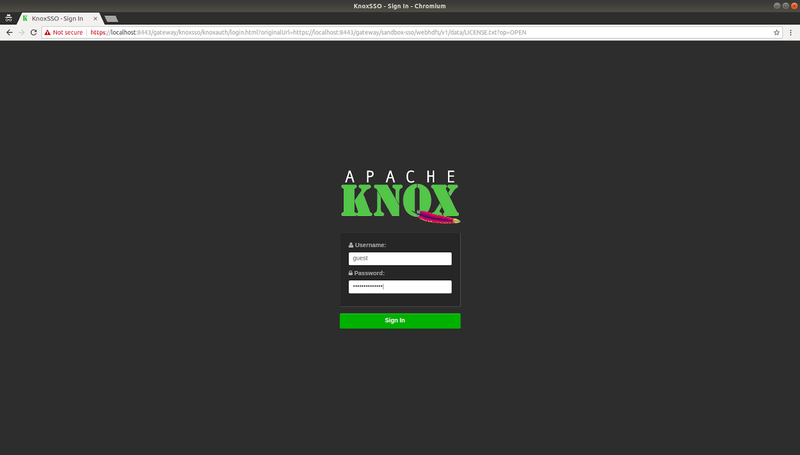 As a prerequisite to this tutorial, follow the first tutorial to set up and run Apache Knox. ranger.sso.publicKey - Edit gateway.cer we exported above and paste in the content between the BEGIN + END part here. Now we're reading to log in to the Ranger Admin Service UI. Start Ranger via "sudo ranger-admin start" and open a browser at "http://localhost:6080". You will be re-directed to the Knox SSO login page. Login with credentials of "admin/admin-password". We will be redirected back to the Ranger Admin UI and logged in automatically as the "admin" user. Finally, there are some additional configuration parameters we can set on both the Knox and Ranger sides. It's possible to enforce that the KNOX SSO (JWT) token has a required audience claim in Ranger, by setting the "ranger.sso.audiences" configuration parameter in "conf/ranger-admin-site.xml". The audience claim can be set in the "KNOXSSO" service configuration via the "knoxsso.token.audiences" configuration property. It is also possible to change the default signature algorithm by specifying "ranger.sso.expected.sigalg" in Ranger (for example "RS512") and "knoxsso.token.sigalg" in Knox. This is the seventh in a series of blog posts exploring some of the security features of Apache Knox. The previous post looked at how to achieve single sign-on using the Knox SSO service, where the Knox SSO service was configured to authenticate the user to a third party SAML SSO provider. In this post we are going to move away from authenticating users, and look at how we can authorize access to Apache Knox using Apache Ranger. POLICY_MGR_URL: Set this to "http://localhost:6080"
REPOSITORY_NAME: Set this to "KnoxTest". Save "install.properties" and install the plugin as root via "sudo ./enable-knox-plugin.sh". The Apache Ranger Knox plugin should now be successfully installed. One thing to check for is that the user who is running Apache Knox has the correct permissions to read the policy cache ("/etc/ranger/KnoxTest/policycache"). Now restart Apache Knox before proceeding. You should get a 403 Forbidden error due to an authorization failure. whereas using the "guest" credentials ("guest"/"guest-password") should be denied, as we have not created a matching authorization policy in Ranger. This is the fifth in a series of blog posts exploring some of the security features of Apache Knox. The previous post looked at how to achieve single sign-on using the Knox SSO service, where the Knox SSO service was configured to authenticate the user to an LDAP backend using the "ShiroProvider" configured in "knoxsso.xml". However, Knox SSO supports more sophisticated scenarios, where the user is redirected to a third-party Identity Provider for authentication instead. In this post we will cover how to set up the Knox SSO service so that a user is redirected to an OpenId Connect IdP. Click on the registered client and save the client Id and Secret for later. where the values for "oidc.id" and "oidc.secret" are the values saved from Fediz above when registering the client. You will be redirected to the Knox SSO service and then on to the Fediz IdP. Authenticate with "alice" / "ecila" and grant permission to issue a token. The browser will then be redirected back to the "sandbox-ssopac4j" topology and "LICENSE.txt" should be successfully downloaded. 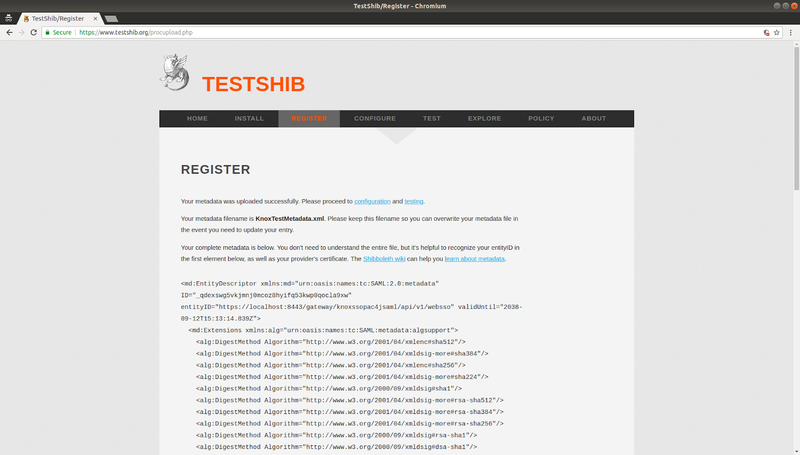 I recently covered on this blog how to deploy the Apache CXF Fediz IdP in docker, as well as a "hello-world" application which uses the IdP for authentication (using either the WS-Federation and SAML SSO protocols). In that post, the user is instructed to select "realm A" (the home realm of the Idp) when prompted, and so the user is authenticated locally. 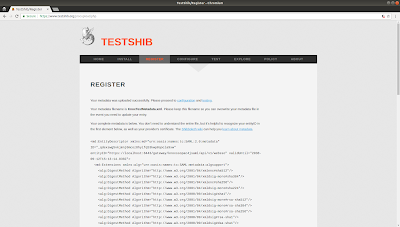 In this article, we are going to take things a step further, and instead authenticate the user in "realm B", which will be an Apache CXF Fediz OpenId Connect IdP, also deployed in docker. So the "hello world" web application will speak WS-Federation to the first IdP, which in turn will redirect the user to the second IdP for authentication using the OpenId Connect protocol. cd sts; docker build -t coheigea/fediz-sts . cd idp; docker build -t coheigea/fediz-idp-realmb . cd oidc; docker build -t coheigea/fediz-oidc . Once the IdP has started, open a browser and navigate to "https://www.fediz.org:20002/fediz-oidc/console/clients". This is the client registration page of the Fediz OIDC IdP. 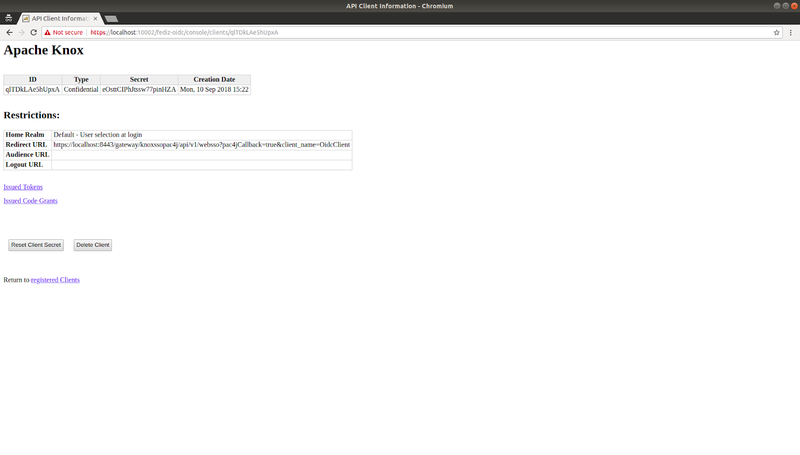 Authenticate using credentials "ALICE" (password "ECILA") and register a new client for the "realm A" IdP using the redirect URI "https://localhost:10001/fediz-idp/federation". Click on the registered client and save the client Id and Secret for later. docker build -t coheigea/fediz-idp . Before launching the "realm A" IdP via the docker-compose.yml in github, we need to edit it so that it launches on the same network as the "realm B" IdP in order to be able to reach it. Find the running docker instances via "docker ps" and then run "docker inspect" on one of the Ids. Look for the "Network" section and note the network name (for example: "tmp_default"). docker build -t coheigea/fediz-helloworld . Open a browser and navigate to "https://localhost:8443/fedizhelloworld/secure/fedservlet". Select "Realm B Description" when asked to choose a home realm in the "realm A" IdP. The browser is then redirected to the "Realm B" IdP (authencate using "ALICE" and "ECILA"). The "Realm A" IdP will obtain an IdToken from the "Realm B" OIDC for the user "ALICE", and then swap it for a SAML Token via the STS. This is then returned to the "fediz-helloworld" application via WS-Federation. Note that the landing page now shows the user as "ALICE" (whereas before the realm A user was the lowercase "alice").